Maggots, Bats, and Turds-Oh My! We were gone for more than a week on vacation and Oreo did a great job with my parents. My parents know how to manage and work with Oreo when she is stressed. They had 2 incidents of barking/lunging with a dog and a girl when she was too close. Oreo came back happy, but with gooey ears and bumps on her belly. She spent a lot of time outside (which she LOVES) but her body does not like (allergies). Just like a baby, puppies put anything they can get a hold on into their mouths. Unfortunately I have had the displeasure of taking some very NASTY things out of her mouth. On our walks she would have something in her mouth before I could even tell what it was, so I would stick my fingers in her mouth (not recommended) to get it out afraid it was something non-edible. On our walk one day she gobbled something in her mouth, I went to get it out and AHHHH I got it out only to find maggots crawling on the item and on my hands. GROSS. Needless to say I guess I didn’t learn my lesson. In the Poconos she had something in her mouth. I was hesitant this time to stick my fingers in their to get it out, but with some urging that it was just black plastic from my mom I put my hands in their again. After she spit it out, I then realized what I was grabbing at was a DEAD BAT! UGH!!!! Again, I didn’t learn my lesson and next time wound up with goose turds on my hands. Just goes to show you never know what you’re gonna get when you stick your fingers in your puppies mouth. On a serious note, we should watch what our puppies eat. I have heard countless stories of dogs eating metal, balloons, plastic, and other items only to end up at the vet to have major surgery to remove it. For puppies, eating anything is normal behavior, so going to a class or teaching your puppy to “leave it” or “drop it” can be very important. One way to practice “drop it” is to have your dog play with a toy. When the dog drops it-click and treat! 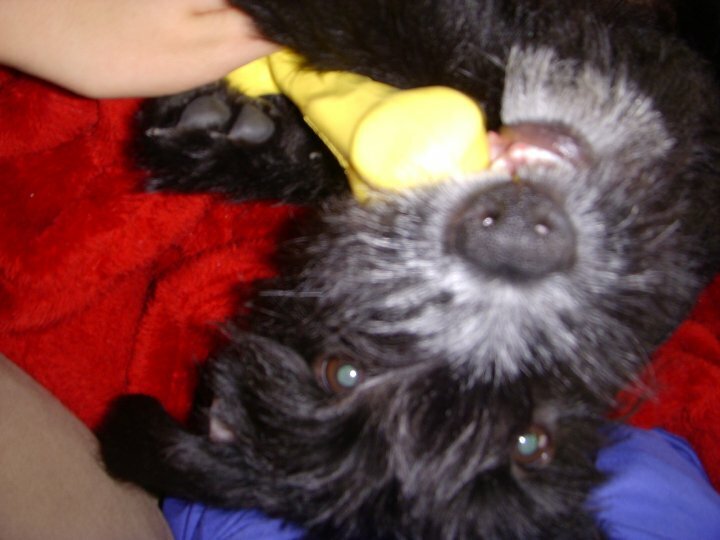 Your dog will get the hang of it and you can add the words “drop it” as the dog drops the toy then click and treat. Eventually your dog will associate “drop it” with dropping the toy or item, then receiving a treat for it. You want to try this with lower value items (things your dog doesn’t want as much) to items that are highly valued (their favorite bone, toy, etc). “Leave it” can be taught many different ways. One way is to put a treat in front of you. As your dog approaches say “leave it.” Keep your hand close by to cover the treat if the dog approaches. Then uncover and say leave it again. When your dog hesitates – CLICK! then pull a treat from your pocket. Continue practicing by adding distance and different toys/things that your dog wants. Always start with low value items to higher value items. If your dog cannot “leave it” do not move on to a higher value item. Also, make sure your dog has some chew toys-especially when they are a puppy. These 2 things are very important so your dog doesn’t get maggots, bats, or turds in their mouths that you may have to pull out! 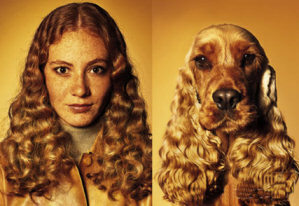 Did you ever hear the saying that dogs look like their owners (or family)? Well sometimes dogs also have the same health problems as their owners. I have hypothyroidism, autoimmune thyroiditis. The tests came back and Oreo has it too! I am sad that she has it, but glad that it is super common, treatable, and that there was something to explain her behavior and health problems. Hypothyroidism is when there is not enough thyroid hormone circulating in the body. This can cause many problems including: Tiredness, exercise intolerance, intolerance to cold, aggression, loss of hair, excessive shedding, weight gain, flaky skin, dandruff, pimples, chronic ear infections, slow heart rate, seizures, anemia, behavior changes and many other problems. Oreo has had many of these things, including reoccurring ear and skin infections, dandruff, dry skin, intolerance to cold, tiredness, exercise intolerance, aggression and behavior changes. We started her on levothyroxine and a supplement to help support her thyroid. We did have her thyroid levels checked before and they were fine. However, the vet didn’t check her antibodies. The vet at Smith Ridge checked them, and it’s a good thing she did. She said Oreo would’ve crashed. So remember whenever you are getting a test, even if it’s more expensive pay for it because it will pay off in the long run. Discussing tests, make sure you always get the Snap test- 4 prong, so it tests for problems caused by ticks that can lead to kidney failure. Oreo has been calmer lately and happier when we are taking walks. She has more energy and wants to play more. She is still itchy sometimes, but she has improved over 80%. On another note, my husband and I went away last weekend and she did fantastic with my parents! It’s always worrisome when I leave for vacation. I don’t like having to have to worry about her, but now I know she will be fine. Next week we are going away for a week to Disney and she will be staying with my parents. She has a great time staying outside in their big yard with them all day and going on hikes. Also thank you Bassas Blog for naming my blog one of the 52 stars of the blogging world! Smith Ridge Veterinary 3 Hour Trip! As you all know Oreo was having BIG problems with allergies. She started acting weird too! She had a panic attack at reactive class when my husband disappeared. She also screamed and pulled me all the way to my sister’s car when she came to visit. I usually know she’s very sick when she is laying on me or near me all the time, which has been going on. So, I decided to try something different. Marty Goldstein is famous for doing holistic medicine with lots of supplements. He has a book entitled, “The Nature of Animal Healing.” This book was recommended by Oreo’s trainer. She told me to read it and if I was interested, seeing him might be worth a try. Goldstein believes that dogs and cats can heal themselves. They discuss how vaccines are very hurtful, especially to dogs that have bad immune systems or are fighting allergies. Many times dogs are prescribed antihistamines (Benadryl etc) or given steroid shots to treat the symptoms. Unfortunately, it doesn’t treat the problem and get to the root of the problem. Oreo has had behavior problems, repeated bacterial ear and stomach infections, skin infections, and yeast infections. She was so miserable she would itch around her eyes all day and rub them against the couch, floor, or anything she could find. She was miserable. She was sleeping all day and seemed depressed and irritable. Her behavior was more anxious and upset. So I decided to take off a day and drive her all the way up to the Smith Ridge Veterinary Center. My mom volunteered to take the trip with me. The drive was almost 3 hours and was surprisingly nice. We went all the way to the edge of Connecticut and New York. Trees were copious on our ride and gigantic mansions surrounded the town of South Salem New York. We stopped and had sandwiches at a park. We arrived to find the vet center off to the side of a shopping center. I arrived to find homey waiting room and a wonderful receptionist. I was VERY concerned about getting her in and out of the center without seeing other dogs. I also did NOT want her to be in the room with me when I was discussing issues with the vet. If she waits in that room she will usually hide and shake under the chairs and snap if the vets come near her because she is so afraid. However, they insisted. The room had a nice bed for the dog and a bench for us to sit on. Oreo went in and laid under the bench while I gave her a kong full of treats. I think I was more nervous than her, which I am sure rubbed off on her. Anyways, when someone would come in the SMALL room she would get up alert, bark, and even growl. The vet was very nice and gave her lots of treats. Then Oreo would return under the bench. She would STARE at the vet and then start growling or come out a little. She was torn I think-couldn’t decided if the vet would prick her with needles or give her treats. It wasn’t like her to growl like that, but the place was strange, so were all the people. We discussed how vaccines are bad, her behavior and allergies. The vet did a round of blood tests and an allergy test. Yay!! We will FINALLY learn exactly what she is allergic to! This will take 2-3 weeks to get results, but I have been staying away from chicken since that is the number one allergy for dogs. I have found that since I took her off the chicken her itching has decreased 60% which leads me to believe I was making her sick by giving her chicken! That is also what I fed her at training-yikes! The vet had us leave the room so they could do all the tests in the room. In the back they have too many dogs back there so she would be too anxious. They said she was very good and a vet tech even came back to give her a treat! Excepttttt she came in and scared Oreo then came close and bent over. Oreo didn’t like that, but later happily accepted a treat from her. I have a few supplements for Oreo and also a natural steroid just for 2 weeks to calm her eye irritation down. We are working on building her immune system so eventually we can start taking some supplements away. However, the vet didn’t want to recommend too many supplements until we find out what she is allergic to (so that means maybe more?). Right now she gets a calming supplement, and immune system/cleansing supplement, and probiotics. I have been cooking turkey meatloaf for her with brocoli and ordered a calcium supplement. Her behavior hasn’t been as strange, although she still seems more anxious than normal. At the park a bug startled her and birds flying out of trees scared her badly. The other day I moved a blanket on the bed and she got up looking around in a panic and started growling. Perhaps she was sleeping, but still-that’s not normal for her. However, she has been much more active lately and wants to play. Additionally, I have been taking her to the park instead of walking around the dog filled neighborhood. She has been happy as can be at the park and pulling (which is much better than her geriatric walking she was doing lately-and she’s only 2!). Her itching has improved and the area around her eyes are starting to get better. I’m not sure if it’s the supplements, walking in the park, home cooked meals, or not eating chicken, but everything seems to be helping! I am sad to have her stop reactive training, but right now we need to work on her health. I do think she was almost done with reactive training and we would move on to something else. I couldn’t think of activities to improve on with other dogs or people since she loved everyone there. However, in the future when this is all sorted out I am sure I will go back whether for reactive class or another class with her since she enjoys it so much. The reactive class was my support group which makes me sad to have to leave but Oreo’s health was impacting her behavior and she regressed immensely when her health was down. I have met some great people who also have reactive dogs with the blog which is great! I will continue to work on relaxation protocol and activities at home, however I am taking a much-needed break. Her health issues have had me constantly stressed and a mess lately and there is some relief knowing that I can take a break for a little.